Renal artery stenosis is the narrowing of kidney arteries. When the blood flow is normal through your kidneys, your kidneys rid your body of wastes. The kidneys filter these wastes into your urine, which collects in your bladder, and from there the wastes exit your body when you urinate. Your kidneys also help control your blood pressure by sensing the blood pressure and secreting a hormone, called renin, into your bloodstream. The amount of renin secreted by your kidneys can help regulate your blood pressure if it is too high or too low. When your kidney blood vessels narrow or have a clot, your kidney is less able to do its work. Your physician may diagnose you with renal artery stenosis. This condition may cause high blood pressure and may eventually lead to kidney failure. What are the symptoms? What if I suffer from high blood pressure? You may not notice any symptoms. Renal artery stenosis develops slowly and worsens over time. If you have high blood pressure, the first sign that you may have renal artery stenosis is that your high blood pressure may become worse or the medications that you take to control your high blood pressure may not be as effective. It may be that the reason you have high blood pressure is that you have a renal artery stenosis. Other signs of renal artery stenosis are a whooshing sound in your abdomen that your physician hears through a stethoscope, decreased kidney function, congestive heart failure or, eventually, a small shrunken kidney. Contact Specialist Vascular Clinic if you are having symptoms of renal artery stenosis. Early detection of renal artery stenosis is important so the right treatments can be provided before the disease becomes severe enough to lead to complications, such as severe high blood pressure, renal failure and need for dialysis or transplant. A Duplex ultrasound is a simple, non-invasive test used to examine blood circulation. This test may be used to detect a blockage in an artery. This is usually performed in the morning as you will be required to be fasting prior to your renal artery ultrasound. Other tests may include angiography or CT scan. During angiography contrast material (dye) is injected into the blood vessels being examined, and X-ray pictures of the inside of the blood vessels are produced to evaluate blood flow and detect possible blockages. This also allows the surgeon to treat the problem at the same time as required. A CT scan is a technique in which multiple X-rays are taken from different angles in a very short period of time. The images are collected by a computer and cross-sectional "slices" of the blood vessel are shown on the monitor. This can be a very accurate method to visualise the renal artery stenosis but does involve the use of contrast dye. You will be required to be well hydrated prior to this test. Medications, interventional procedures and open bypass surgery are the treatments available for renal artery stenosis. If you have a renal artery stenosis that merits interventional treatment, then it is likely you will be recommended to undergo renal artery stenting. To perform this procedure, your surgeon inserts a catheter through a small needle, and guides it through your blood vessels to your renal artery. The catheter carries a tiny balloon that inflates and deflates, flattening the plaque against the walls of your artery. Next, your physician may insert a tiny metal-mesh tube called a stent in the artery to hold it open. This procedure, when needed, is often performed at the time of angiography. Many cases will also be performed under embolic protection by using a filter basket to prevent debris reaching the kidney. Figure 1 demonstrates the angiographic appearance of severe bilateral renal artery stenosis in a man with hypertension and declining renal function. The origin of each renal artery was narrowed by plaque as it branches away from the aorta. Figure 2 demonstrates the completion angiographic appearance of the lesions in Figure 1. 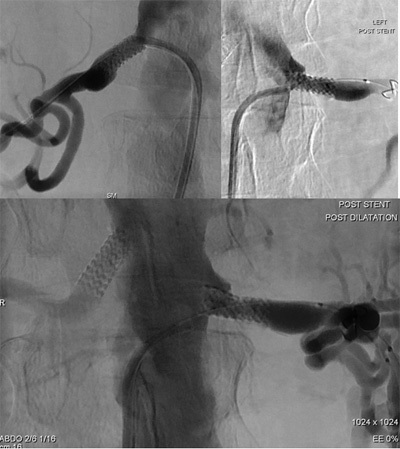 Note the use of an embolic protection device (seen beyond the stent on the top right image). There was successful resolution of the stenosis with no complications. The patients' high blood pressure lowered after the procedure and in follow up his renal function has slightly improved and certainly not deteriorated. Tel: (02) 9439 1110 (02) 9439 1110 or request an appointment online.